Salvage the Bones by Jesmyn Ward: We must first confess that we no longer remember how this book got on our list, as it does not have a legal connection. It was, however, both deeply disturbing and beautifully written. The writing reminded us a bit of Zora Neale Hurston, and it was so good it was worth lingering over. The book is about a family in the path of Hurricane Katrina, as they prepare (or don’t). One of the most striking things was the way that the family seemed so disconnected from weather reports, evacuation orders, and public uproar – and so the hurricane’s impact is particularly harsh. The author and her family survived Hurricane Katrina while cowering in trucks in an open field, and while this book is not biographical, her ability to paint a vivid picture of impact and aftermath is astonishing. In addition to being a book about Katrina, this is also a book about childhood in poverty and without a mother. Highly recommended. Next meeting: Monday, March 4, 5:30 pm. 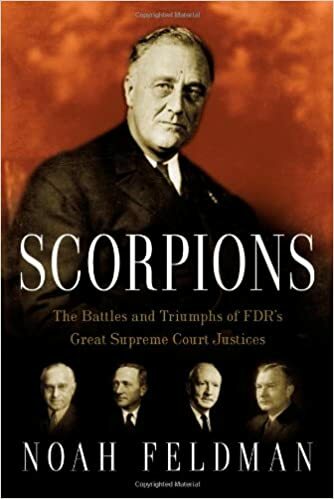 We’ll be discussing Scorpions, the Battles and Triumphs of FDRs Great Supreme Court Justices, by Noah Feldman. Wine and cookies are always served. Contact Tiela Chalmers (tiela@acbanet.org) for more information and to RSVP.